Lo, it is my attempt at a video blog post! I am not sure why the sound is so out of sync, but clearly I’ve got some learnin’ to do. To cut through the blogosphere, it helps to make yourself into a trusted resource. To deal with the oversaturation, you want to carve out a niche within a niche. You can do this by combining different elements of your identity. This way you also exploit “the power of the intersection”: where two different sets of ideas meet and mingle, and spark off fresh new insights that can make you look like a GENIUS. Another advantage is that by writing out to the different edges of your niche, you can further develop your audience. Amazing post, so happy to see you jumping into this frontier! You definitely have the smarts and voice and wisdom for it. Well done, Bella. Thank you for the interesting blog posts over the year. I have referred my readers to your blog often as you write wonderful thought provoking articles. For myself when I started writing a blog two years ago I didn’t have any idea what I would talk about as I was very aware I was just starting out on the web and didn’t know anything but I was keen to learn. So that became the subject of my blog. Once a week I blog about changes in the publishing industry, spotlight interesting writing related posts and marketing ideas for children’s writers. I do this to show children’s writers in my country what is happening overseas because before too long these changes filter down here. Forewarned is forearmed etc etc…. Without any planning I have become one of those Go To people here…This year I joined facebook and twitter and ended up involved in an online evolving children’s book project with fellow writers from New Zealand. So now I’m fairly well known here in my writing community online…and it has all been accidental. Merry Christmas from the sweltering Southern Hemisphere. Congrats on your first foray into video blogging. Your whole discussion on intersection has really challenged me. Right now I can’t say I’m combining too many ideas with my blog/website; I really need to discover how I can combine my passion for fantasy fiction/comics, with something else. Damn you Justine, for making me work harder! I think you have a good point here. Everything needs an edge, a twist, something that makes it different from the crowd. I’d call it a gimmick but, although accurate, the term tends to be used derogatively or if not that bad then there are often some negative associations. There were plenty of wrestlers out there and then one day one of them decided to wear a mask and for a while a few got on the bandwagon but now it’s lost its edge. But I agree with you if you can take two demographics and mix them then you’re doubling your potential audience. Nice video – well done. And I couldn’t agree with you more about the genius of Anthony Bourdain. He’s been my top role model in the publishing business ever since I started writing fulltime. Bourdain is *exactly* what I’m talking about when we’ve chatted in the past about authors with powerful multi-media platforms and careers, ones that aren’t primarily/solely based on online activities. You’re right about Bourdain finding the “intersections” between categories (i.e. both food and travel – not to mention writing both nonfiction and fiction), but he has also nailed the intersections between different media (namely print – both books and magazines – and TV/broadcast) in building his platform and career. There are many writers I love, and many television “personalities” I enjoy watching, but Bourdain is one of only a few who successfully combines the two (Bill Geist is another, as well as the late Charles Karault). That’s the kind of crossover appeal – and platform – I’d love to develop some day as a nonfiction writer. Thanks again for posting your video. I have found my niche. Many others have found my niche too. I invite all Tribal Writers to see what one person can do against all odds. Please be my guests at http://www.LongShortStories.com. I’ll leave the light on. Thanks for sharing. My niche is technology (i.e. software). Bourdain does combine food & travel, but a third layer is what his distinct personality/voice adds. He’s irreverent, and he appreciates simplicity (country food prepared by country folk); he becomes less and less comfortable and more cynical the more mainstream and high-falutin’ is the dining locale. PS You do have an audio problem but what a beautiful voice! Voice is the most important thing of all. Bourdain is wry, smart, observant, honest, kind of shameless. He’s awesome. Maureen — I know what you mean. A blog has a way of evolving, and suddenly you’re an accidental “expert” (which I think is the only way to be one, since you’re only an “expert” if someone else calls you that). I spent one Christmas in Australia, by the way, so I remember that sweltering holiday climate! David — Unicorns. ‘Nuff said. Adam — If you examine your posts, you might catch clues leading you in a particular direction. It’s kind of part strategic, part organic. Seeing what people resonate with, what *you* resonate with. Jim — My favorite cynic! :) I don’t know if you’re doubling your audience but by writing out to the edges you’re giving yourself more room to move (which makes things more interesting for yourself) and expanding the group of people from which to draw your audience. You’re also giving yourself the opportunity to reveal different facets of your personality, knowledge. You can open up a whole new dimension of yourself, the way Bourdain did with world travel. Jeff! — The strongest platforms are definitely both online AND offline, I just think for most people *today* it takes a lot of building in the former before you can get access to the much more tightly controlled world of the latter. Although eventually everything will move online in one way or another, or have an online component. Shenee! — I think you’re tapping into something very powerful with that idea of creativity/idea generation plus execution. Do you read Lateral Action? — http://www.lateralaction.com or http://www.the99percent.com? They’re in a similar vein & they’re great blogs to be inspired by. Wayne — that is awesome & I will check out your site & thanks for helping to invigorate the short story form. Important work! Enjoyed the article but that is not why I am commenting today. I wanted to inform you that your Blog is #9 on my “12 Blogs by Christmas” today. Hi Justine, I have So been enjoying your blog. And between this and your last post, you have become the buzz among my writing friends. We’ve been discussing your proposals in depth on how to find that blogging voice that’s all us. I’ve been lucky with my own. Over three years ago I started posting a coloring page on my blog every Tuesday. It became “Coloring Page Tuesdays” at http://dulemba.com/index_ColoringPages.html . It may sound like a silly thing, but I’m a children’s book author/illustrator and my coloring pages have become a resource for teachers, librarians, booksellers and parents – my target audience. I have about 2,500 subscribers to my weekly newsletter now and it’s become quite the ‘thing’ – an unexpected success! Oh, and around Camp Dulemba – we love Bourdain too. Thanks for such thoughtful posts! 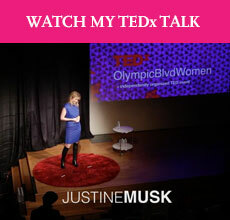 Justine – great post. I know you read Penelope Trunk too – she’s a brilliant example of what you are saying here. Especially because she joins corporate life to shocking honesty, not common bedfellows. I write a style blog, with a sub-niche of classic style meets social anxiety meets class in America. Style for snobby but self-deprecating intellectuals. It’s better than it sounds. Again, great post. You are spot on.